Dr. Hidegoro Kanasugi returned to Tokyo from Germany in April 1892, and in May began practicing otology and rhino-laryngology. He initiated lecturing on otology and rhino-laryngology at Tokyo Jikei Hospital Medical School that September. Dr. Kanasugi formed the Tokyo Oto-Rhino-Laryngological Society together with seven other medical professionals on February 19,1893. This Tokyo society was the beginning of today’s Oto-Rhino-Laryngological Society of Japan. The first general meeting of the Tokyo society took place on October 28, 1893, with Dr. Kanasugi serving as the president. In November 1894, Dr. Kanasugi founded the Oto-Rhino-Laryngology Research Institute and began publishing the Oto-Rhino-Laryngology Journal, which formed the basis for our Society’s present journal. As President of the AAO–HNS/F, it is my great honor and privilege to welcome the Oto-Rhino-Laryngological Society of Japan to the AAO-HNSF 2018 Annual Meeting & OTO Experience in Atlanta, Georgia, October 7-10. We look forward to the opportunity for continued friendship, camaraderie, and networking among friends and colleagues at the meeting. In addition, we look forward to our societies working closely together to improve the care and quality outcomes for our patients worldwide through this continued collaboration and outreach as our global message continues to resonate around the world. During the general meeting of the Tokyo society held on January 17, 1897, the group’s name was changed to the Dainippon Oto-Rhino-Laryngological Society in anticipation of the organization’s future growth. The Society retained this name up through its 47th general meeting held in 1943. On November 10, 1899, the government issued an Imperial Ordinance that an oto-rhino-laryngology course of study be established following the forensic medicine course in the Imperial University Medical College. Accordingly, on January 19, 1900, after study in Germany, Associate Professor Waichiro Okada established an oto-rhino-laryngology course at Tokyo Imperial University. Dr. Okada was appointed as the first full professor of the University on March 31, 1902. By 1912, the Society had grown into a huge academic body with 826 members. Once World War II broke out, many members went into active service, and the number of faculty rapidly declined at every university. As the war situation worsened, medical diagnosis, care, and research activities inevitably stagnated. Regardless, the Society did hold its 47th annual general meeting in Kanazawa in 1943. The Society lost many members, with the number declining from 2,327 in 1944 to 1,906 in 1948. Following the end of World War II, Japanese medical circles came to be greatly influenced by American medicine. Japanese medical practitioners were exposed to advanced U.S. practices through the medical literature brought by the U.S. military stationed in Japan, and were left with no choice but to convert from German to American medicine. Despite the dearth of research facilities and the shortage of personnel, the Society held its 48th annual meeting in Osaka in April 1947, using its new name, the Oto-Rhino-Laryngological Society of Japan. The Society soon regained its vigor and solidified preparations for dramatic future advances in terms of both organizational structure and academic content. The 8th International Congress of Oto-Rhino-Laryngology was held in Japan in 1965. Not only was this meeting a great success, but the participants also approved a Japanese proposal to establish the International Federation of Oto-Rhino-Laryngological Societies (IFOS), something that foreign countries had tried, but failed, to accomplish for many years. This was a result of the scientific advancement of Japanese oto-rhino-laryngology through our Society and the unified efforts of its members. 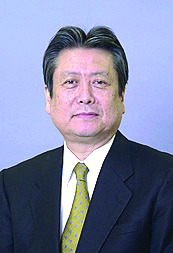 The initial IFOS Secretariat was located in Tokyo, with Dr. Jo Ono as the General Secretary, and IFOS has subsequently played a leading role in oto-rhino-laryngology international exchange activities. The IFOS Secretariat remained in Tokyo for 12 years and was relocated to Mexico in 1975. The history of this seminal period of the IFOS was compiled by Dr. Ono, published as “Record of the First Twelve Years of IFOS” in April 1981, and distributed overseas. Japanese oto-rhino-laryngology has continued to advance. Starting with the founding of the Japan Broncho-Esophagological Society in 1949, our Society came to have a total of nine different related academic and research societies. The vibrant activities of the Society’s members in each field were evidenced, as numerous devices were developed, including nebulizers and hearing aids in 1948, audiometers in 1949, surgical microscopes in 1957, electronystagmographs in 1959, and microscopic laryngeal surgery implements and fiberscopes in 1966. These and subsequent developments, such as the use of laser equipment, remarkably boosted the quality of diagnosis technologies and treatment contents, and led to countless research findings in each field. 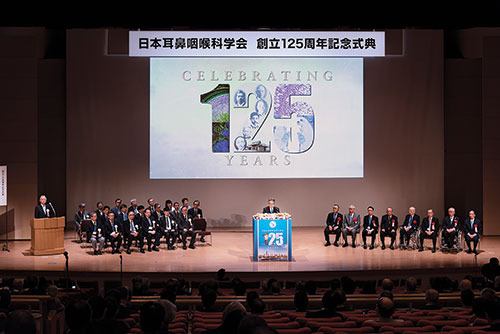 Since the Oto-Rhino-Laryngological Society of Japan celebrated its 100th anniversary in 1993, medicine has witnessed remarkable developments along with advances in cutting-edge technologies. The advance of our discipline has inevitably been accompanied by finer specialization into smaller fields. This is evidenced by the approximately 25 groups that have spun off from our Society since 1949. Sixteen of these are still recognized by our Society as related societies. The Oto-Rhino-Laryngological Society of Japan instituted a system for the certification of specialists in 1984. Our members work to improve the quality of their practice through a continuing education program. Our membership is also steadily growing, rising from 7,147 in March 1983, to 10,969 in June 2018. To celebrate our 125th anniversary, our society held an annual meeting at Yokohama on May 30 through June 2, 2018, with Prof. Tatsuya Yamasoba as the president. At the ceremony, Dr. Hiroshi Moriyama, the board chairman, addressed opening remarks and Dr. Yasuya Nomura, a former board chairman, enthusiastically looked back our long-lasting honorable history. As distinguished guests, Dr. Morito Monden, the president of the Japanese medical science federation, and Dr. Yoshitake Yokokura, the president of the Japan Medical Association, offered congratulatory remarks. At this meeting, two special lectures were given by distinguished professors of our society, Prof. Yu-ichi Kurono and Masafumi Sakagami. 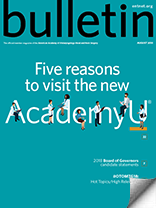 Also included were four symposia including a plenary symposium “The past 25 years advancement and future perspective in otorhinolaryngology field,” five panel discussions, including “The role of ENT doctors in the super-aging society,” 18 educational seminars, six international sessions, 435 oral and poster presentations, 26 morning and luncheon seminars, and hands-on seminars. All were respectively well done. Two special lectures by famous professors in other areas were also provided. Prof. Masaru Kitsuregawa talked on “The impact of big data, AI, and IoT on health care,” and Prof. Kazunori Kataoka talked on “Nanotechnology and its contribution to medicine.” We also welcomed two guest speakers from the United States, Prof. Bruce Gantz and Prof. Josef Califano. Prof. Gantz gave a lecture entitled “Hybrid Cochlear Implantation Long-Term Outcomes: Insights into the Future” and Prof. Califano talked on the change of treatment strategy for HPV-related oropharyngeal cancer according to new TNM classification. Approximately 5,500 people, including 330 medical students and general residents, attended this annual meeting and had very active discussions on a variety of topics to make it very successful and fruitful.